Beautiful, and the frame looks fine to me! Another stunning card - you've definatley got much better light over there for photographing white on white than we have here today - its about to thunder so hard to take a shot without flash! Stunning card Sylvie - beautifully designed. This is fabulous Sylvie... you've really got the bit between your teeth this week! Another fabulous submission! Another gorgeous LiM card - you were busy this morning!!! Hi sweetie wow this is soooo beautiful & elegant absolutely gorgeous. Hi Sylvie, gorgeous card hun, elegant and classy, well done! Absolutely beautiful, you're certainly firing on all cylinders today! Got any mojo to spare and send my way LOL?! 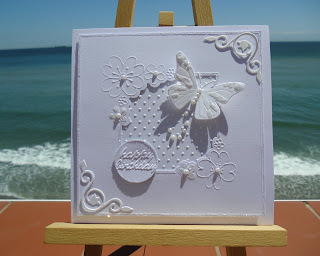 Really lovely card - loving this White on White challenge, just a little stumped for inspiration myself! What a Beautiful card! Just gorgeous! and the view is nice too... lucky you overlooking the ocean. Fab card - so intricate and yet so simple. Another absolutely fabulous entry Silvie. Stunning!!! You're obviously on a roll - and you've nailed this challenge. oh my....in LOVE with another of your cards! All the details are gorgeous! Sylvie, you always have the BEST cards! I love all the wonderful details in this! WOW this is amazing Sylvie. Wow Sylvie this is absolutely stunning.......what more can I say. Also stunningly beautiful. Your first card just slightly has the edge for me as it was so novel. Adorable card - simply stunning. 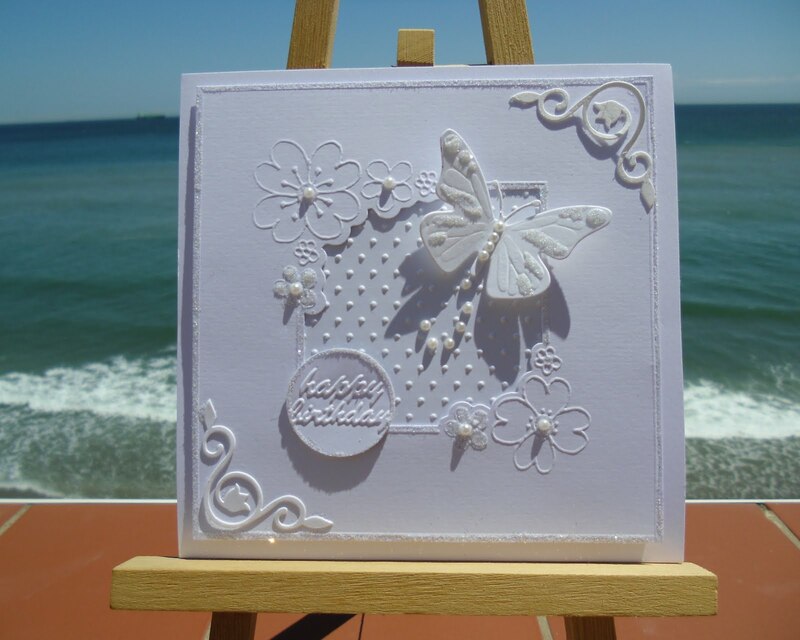 Stunning beautiful pretty card and so romantic, love your view of the sea, you are a tease. WOW Sylvie, you are on a roll. This second card is gorgeous too. I love the embossed center. Fabulous. Absolutely fabulous both cards ,I like the second best tho!!! Another beauty! Sylvie you are on a roll! A beautiful and so elegant card. I love the embossing. love it!!! so many beautiful elements put together so creatively! Your first card was beautiful, but this one is really stunning! Very pretty...love all the beautiful details:)!! Stunning card. Beautiful, elegant and very pretty. WOW....this is just STUNNING!!! Love it! CONGRATULATIONS on being showcased. Thoroughly deserved.